I have baked many batches of Danish Rye Bread since this post. With few exceptions, everything I wrote then still stands. This new post contains a few corrections, but it's mostly about a bread mix that I never thought I'd have to use... until I spent the summer in Montreal, leaving all my breadmaking ingredients behind, but not my desire for one of my favourite foods. 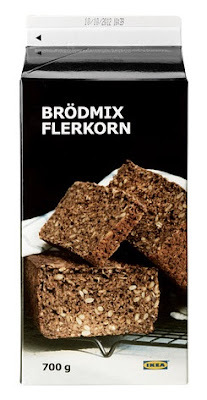 So it was with only a bit of skepticism -- after reading some good reviews of the product online -- that I put a box of Ikea's Brödmix Flerkorn in my shopping cart at the Saint Laurent store the other day. At a mere $5 (Canadian!) for a large loaf (or two smaller ones, as I prefer to make), the bread is a steal. Add to this the fact that you only need to add water -- the instructions suggest that you use the box itself for mixing, but I do not recommend this, at least not the first time. When you pour the mix into a bowl, you can see how much settling and separation of the ingredients has taken place in the box. I prefer the smaller size for my open-faced sandwiches. 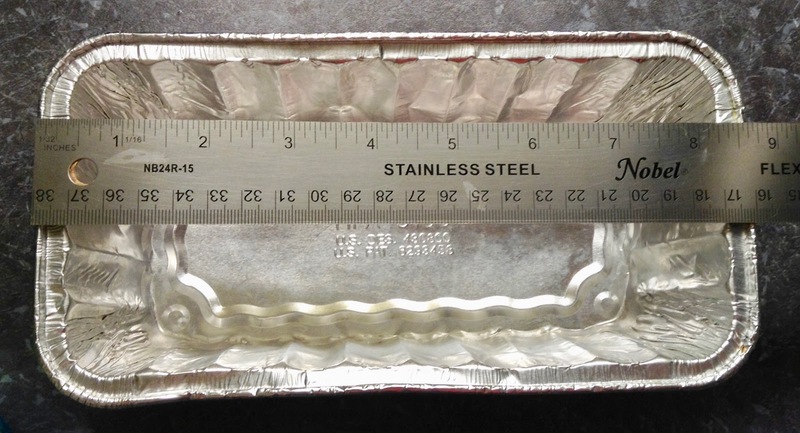 Since I also didn't have my equipment with me, I just purchased some aluminium loaf pans at the dollar store. This is the size that I used. After baking, I washed them and used them over and over before putting them in the recycle bin. It's easy to divide the mix if you have a kitchen scale, but you could also use a measuring cup. Just follow the directions on the package for the resting time -- don't be disappointed if the dough doesn't rise, this step is strictly for rehydrating the grains and flours, not for creating air. As I indicated in my earlier post, you do not want this bread to have lots of air spaces. Look at Ikea's photo, that's what you want. The reason the bottom slice is flat on top is that due to the sugar it did rise a bit, but then it fell back down after I poked it (see #3 below). Honestly, they are both delicious and next time I will definitely try adding some walnuts to the "sweet" loaf. 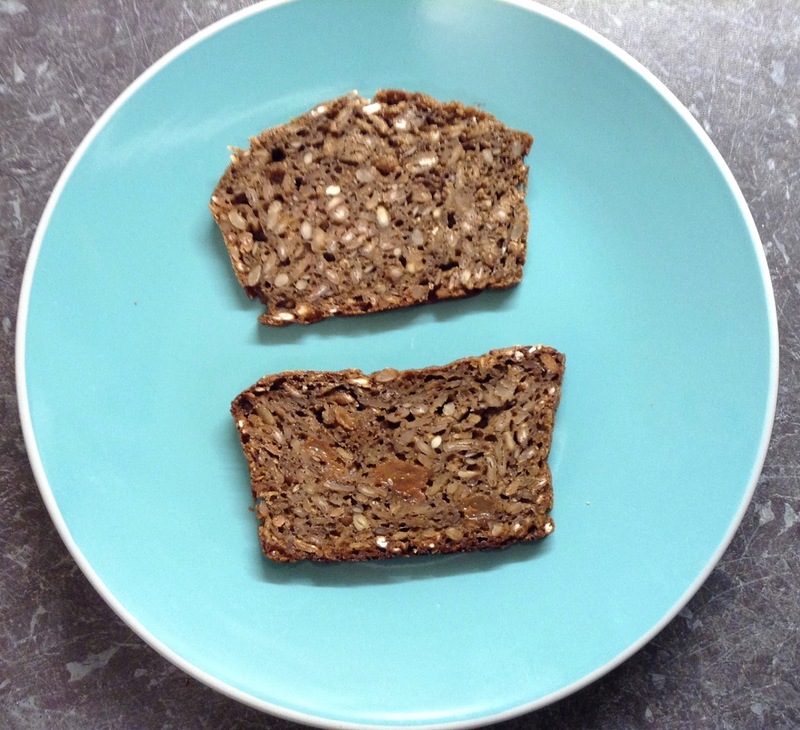 This advice summary is based on all the batches of Danish Rye Bread that I have made since the beginning of the year. I hope it helps! Use a thermometer to check the inner temperature of the loaf - around 200-205 F (96 C) or you may end up with a gooey mess. Make sure your oven temperature is as exact as possible - you especially don't want it to be too hot. To avoid large air spaces, some experts recommend poking loaf all over with a skewer or chopstick before baking. I did that to my "sweet" loaf this time. Large air spaces are undesirable because they make the bread too crumbly to slice. This is what you do to avoid a hard crust -- trust me, a crunchy crust is not a plus for this kind of bread: once your loaf has cooled slightly, wrap it tightly with plastic wrap. This will redistribute the moisture, ensuring the right kind of crust. Let the loaf cool at room temperature, then refrigerate, still in its plastic wrap. This bread tastes better the next day, and even the day after - so even though it's hard to resist having a taste while still warm, you won't know how good it really is unless you leave it to do its thing for a while. Speaking of refrigeration, this bread keeps for weeks in the refrigerator. Keep it well wrapped in plastic to prevent drying out. Even though I show a knife with teeth in my first post, I now know that it's better to use a very sharp knife with a plain blade for getting a nice slice, and as thin as you want. Another of my tricks is to flip the loaf upside-down for slicing. 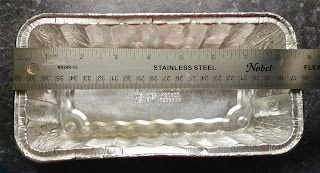 The bottom crust is always softer and thinner, easier to pierce. In case you're not sure about all the different ways to enjoy your new favourite bread, just google "smorrebrod recipes"!